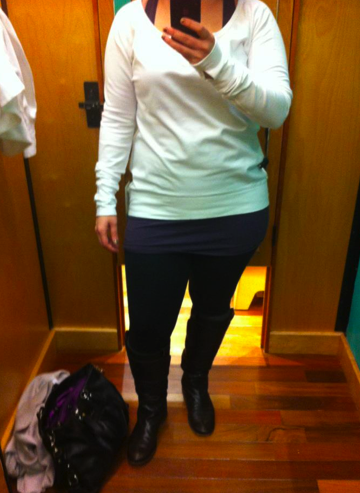 I tried on the Meditation Pullover this afternoon and quite like it. On the hanger I looked at it and thought it was quite plain but once on I really liked the details of how the back is longer than the front, and the neckline on it. 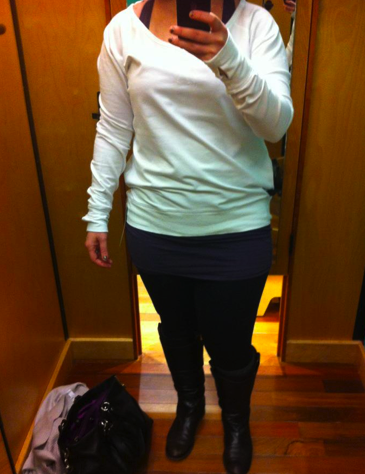 Definitely size down in this top as long as you don’t mind snugger fitting arms. The lower sleeve in the wrist and forearm are a bit snug. This is a loopy cotton french terry so it’s quite thin compared with the Rest Day Pullover or other sweaters that have been out in this material, it’s also stretchy and really soft. I’m waiting to see if this comes in Concord Grape or some other exciting color before I full decide but it is nice that you can wear any CRB or Every Yogi Tank underneath it. Check out how long my Every Yogi Tank is underneath. I sized down to an 8 and it still can be pulled down all the way over my badonkadonk. "Photos of The Latest: City Practice Pant, Meditation Pullover, Dance Studio Jacket and April Wee Are From Space CRB, Run: A Marathon Singlet"